I’ve noticed in discussions and videos on framing and composition, it’s the 1/3 rule that’s always placed out front and center like it’s the alpha and omega of composition. The oh so common, default form of composition in film called the 1/3 rule. Some examples of other types of 2D composition used in the art world. You see, artists have been working in 2D mediums like painting and drawing for thousands of years. They’ve figured out a lot of compositional conventions that resonate with viewers. And yes, film and video is a 2D medium. The problem is, we have two eyes and therefore live in a 3D world. Wherever you are right now reading this article, look around and find what looks like it would be an interesting shot. Now close one eye. It just went flat and a bit dull. Reopen your eye. It’s back. That’s what we’re competing with. A dynamic world made bland in our medium by a loss of 1 dimension. How do we create lively shots that fit our stories in a 2D film and video world? Composition to the rescue. 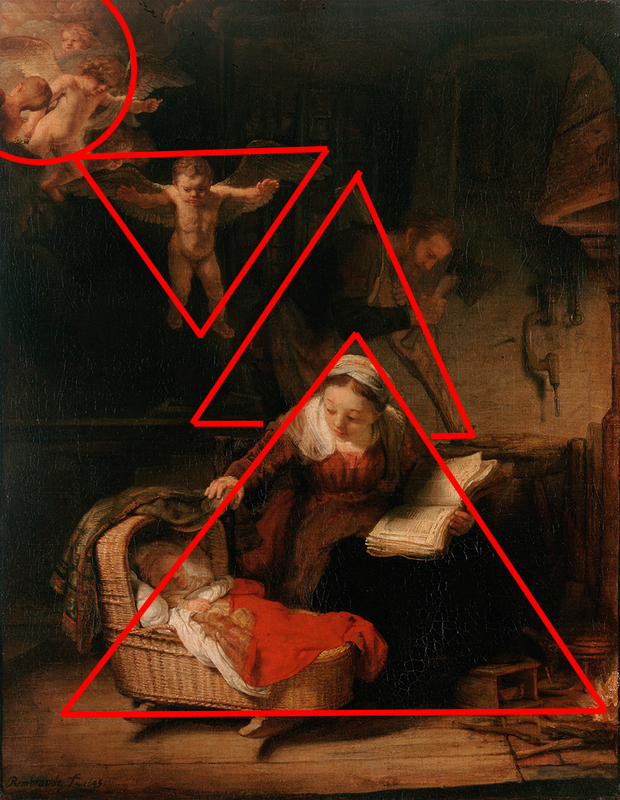 Let's look what the art world has found out about composition. Two Ways to Look at Composition: Focus and Effects. We can use compositions to guide the viewer's eye to a point or points we want them to look at. Focus. The background creates a circle to draw the viewers focus. Primavera by Sandro Botticelli. Shapes like circles, triangles, L shapes draw the viewers eye, into and around an image. The books and piles create a circle like focus on the subject. The Parable of the Rich Fool by Rembrandt. The Virgin and Child by Sandro Botticelli. A composition can also create a feeling, an effect on the viewer. The Storm on the Sea of Galilee by Rembrandt. Diagonals create a feeling of movement and action. Here’s a classic impressionist painting I love. 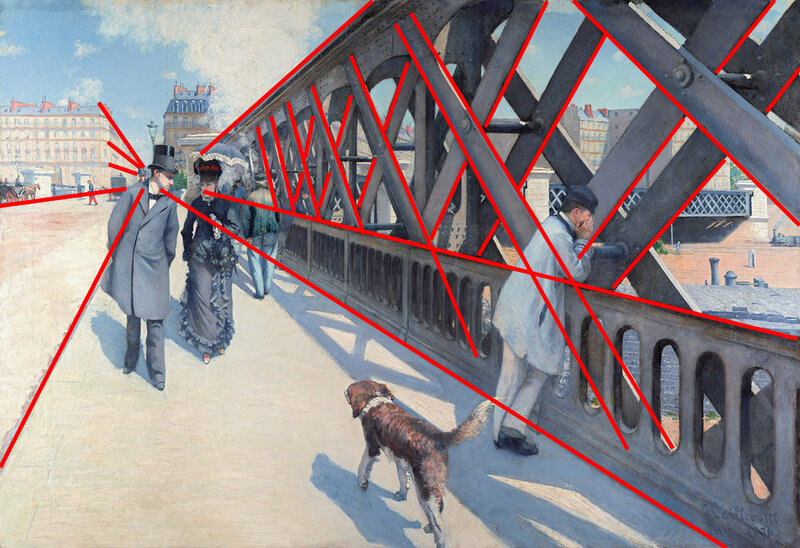 The artist's viewpoint on the bridge create’s diagonal lines that draw the viewer into the painting and give a feeling of action. Can you sense the energy of the environment in Le Pont de L’Europe by Gustave Caillebotte? The street, the sidewalk, the bridge, the buildings in the background. But what’s interesting is how they are in contrast to the people in the frame. The dynamic diagonal lines are everywhere in the environment, in contrast to the casual attitude of the people. A couple casually walking, a man peering over the bridge with his head resting in his hands, a dog strolling. It feels like a lazy Sunday, bright sunlit, as people casually go about their day in the middle of a modern, active city. Train steam in the background. This busy city contrasted by subjects not really doing anything significant. It’s as if the city is the subject and people just added decoration. Example of symmetrical balance used between the paintings on the wall to create calm feeling. The Concert by Vermeer. Example of asymmetrical balance creating a sense of contrast. The Artist in his Studio by Rembrandt. Here’s a scene. A wife is frame left in the foreground sitting at the dinner table, while her domineering husband, in the background frame right, prepares her a drink to cheer her up. He doesn’t know why she’s upset but we do, she just found out he’s been cheating on her. Asymmetrical balance between the wife in the foreground and husband in the back. She’s dominant in the foreground with this L frame composition, in contrast to her lack of power in the relationship in this scene. In this composition, she’s dominant, creating an L in the foreground with the table. He’s small in the background. The asymmetrical framing is in contrast to their relationship where he’s been dominate and possibly foreshadows a change if she confronts him. Flipping the shot, now the man dominates in the foreground, creating his own L composition. But let's change the framing. Now he’s frame right in the foreground, the L shape flipped. He’s dominant in the frame, she’s small. This reflects their current relationship and reinforces her as the meek one. This could create the feeling that nothing has changed right before she explodes and confronts him. Both are not equal in the shot, symmetrical balance. No one has “power” visually over the other. Neither of these shots is “right.” Each gives a different weight to the characters in the scene using composition. This is where you as a director make choices based on how you want to convey the story visually. Which frame would you use? What if you used more then one? This brings up some major differences that film has over 2D art. One is "montage." We don’t stop at one image. We could cut back and forth between those shots in a rhythm that brings her to a boiling point. This is probably why the 1/3 rule is so prominent because it fits when cutting back and forth between two characters. The other difference? Our subjects and the camera can move. We could have her move into the frame to complete the composition or move the camera to do so. These are two examples of using composition to focus the viewer's eye and create a feeling that fits the story. There are many other forms of composition to play with and I’ll have some links in the description below to look. Geared for painters but discusses using a grid while you work.